The Ultraviolet Light Source unit helps Investigators identify the presence of evidence at a crime scene that is invisible under ordinary conditions. 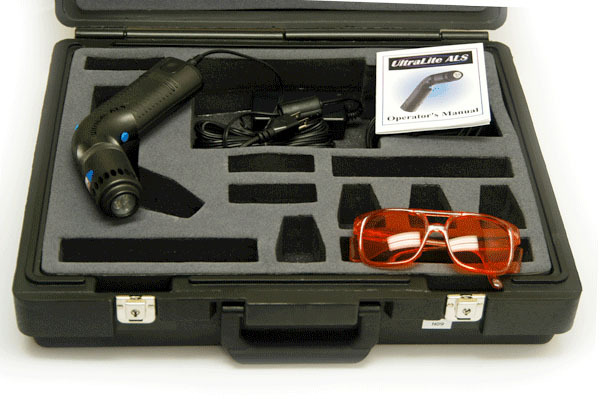 The use of the Alternate Light Source (ALS) provides a highly practical and efficient means of locating fingerprints, trace evidence like hairs and fibers, blood, body fluids, and impressions on human skin. The ALS gives Evidence Technicians and Investigators a more advanced technological tool to use in the field to recover evidence of crimes and identify the offenders. In January of 2015, the Lake Forest Police Foundation purchased this invaluable piece of equipment for the Lake Forest Police Department.